PIXII innovates by moving the software of the camera into a mobile app for boosting its extensibility. The camera features an original rangefinder viewfinder and uses Leica M compatible lenses. Besançon, FRANCE. PIXII SAS unveils the first camera designed to reveal its images on a smartphone display. “The digital camera hasn’t changed much since the 90s. But now the new generation is learning photography with a smartphone : who understands why a camera still needs to bother with a screen or an SD card?” starts David Barth, the creator of Pixii. Pixii is a genuine standalone camera. It records raw images and gives full manual control over the capture settings to the photographer. At the same time it communicates with a mobile application which develops and reveals images on the smartphone screen. The photo can be edited or shared as soon as it is taken. “Photographers know that lenses are generally safe values. However, the software and the screen of a camera quickly get outdated. Instead, we can offer exceptional extensibility and durability by virtualizing the camera software and using the performance of smartphones and their display. ” adds the founder. 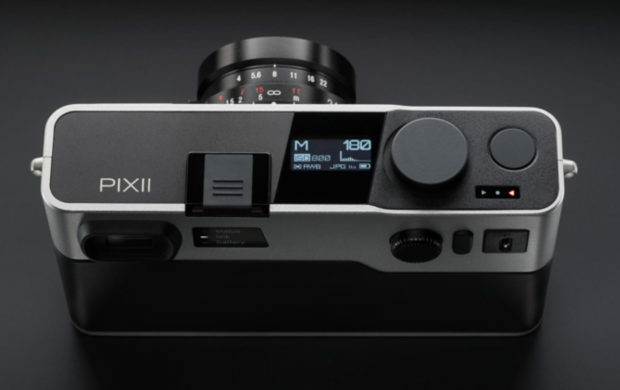 Designed for the new generation, Pixii also draws the attention of more experienced photographers looking for the unique experience of a rangefinder camera. “There are pictures you cannot take with a smartphone: the sensor is too small, the lens is fixed and most of all: there is no viewfinder.” says Melric Artus, Principal Engineer. Pixii is an interchangeable-lens camera with an M-compatible mount. It gives access to very high quality lenses from renowned manufacturers such as Leica, Zeiss or Voigtlander. Its other essential feature is the rangefinder system integrated into its optical viewfinder: the focus is selected by matching two shifted images of the photographed scene. Pixii was unveiled around Photokina in September and attracted the interest of many observers. It is still in the testing phase with photographers from different backgrounds. The price and date of commercial availability will be confirmed in the coming weeks. PIXII SAS is a startup developing a new radical, contemporary, rangefinder camera. The company was created by David Barth and a team of specialists in optics, micro-mechanics and electronics. David brings 20 years of experience in the software industry up until recently at Ubuntu or LaCie. Our ambition is to offer innovative and inspiring tools for all image enthusiasts. More info available at pixii.fr. Leica M-P Full Frame Rangefinder Camera Announced !